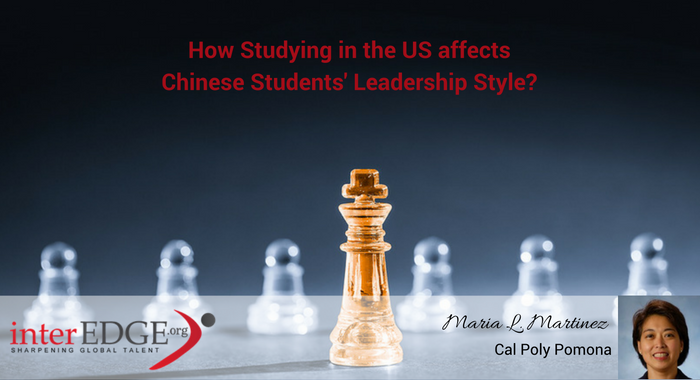 How Studying in the US affects Chinese Students’ Leadership Style? The ability of former international students to apply the Western skills sets they acquired through international education varies according to the type of organization they join. Those who work in multinational corporations use their Western soft skills the most. A qualitative research completed by M. Martinez in April 2016 as part of her Ph.D. in Education program at Chapman University, in Orange, California provides a rare view of the post-graduation life of former international students from mainland China. Entitled “Bridgers’ in the Third Space: An In-Country Investigation of the Leadership Practices of US-Educated Chinese Nationals”, this study describes how Chinese nationals who completed a graduate degree in the United States utilize the skill set they developed while in the United States. Encompassing a wide variety of international students in terms of age, gender, industry, number of years since they have returned home, findings from this study inform the work of administrators and student service professionals on areas where current and recently graduated international students may benefit from more guidance and support. This study indicates that former Chinese international students embody certain competencies that are particularly valuable to employers in mainland China. These competencies result from their exposure and interaction on- and off-campus with individuals with different cultural, ethnic, socio-political, and economic backgrounds. These competencies increase their competitiveness in the global employment market and set them apart from locally educated peers in their home country. The combination of these competencies enables them to interact effectively with individuals from other cultures. They also become natural facilitators of social and professional relations between Eastern and Western individuals. These are elements of global leadership necessary in leading organizations in this age of rapid globalization. International students benefit from interactions with members of the host country. While it is easier, more comfortable and convenient to interact mostly with their co-nationals, international students reap the most benefit from their study abroad experience when they seek opportunities for cultural exchange. Participating in off-campus activities where they can utilize their English language skills and enhance their public speaking skills. Higher education program administrators should consider developing programs that provide structured opportunities for cultural and intellectual exchange. Career centers in colleges and universities can use the findings from this study to provide guidance aligned to the career objectives of the international students. Prospective employers of international students will be more aware of the skills they bring to their organizations.